As writers, we tend to be a little...um, different. 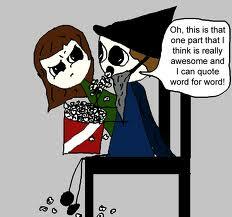 We get together and talk about things that would make a nerd drool, especially if you are a fantasy/sci-fi writer. 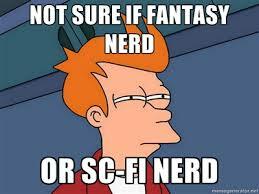 I confess that I am a proud member of the ranks of fantasy nerds. Imagine my mortification, then, when I went to LDStorymakers this past weekend and didn't recognize the images shown from the movie Legend. I'd never seen it before, much to my chagrin. So, I went home, pulled up my local library website, and immediately put it on hold. It was...amazing! Okay, so there wasn't any plot of which to speak, the characters were cheesy and flat, and I laughed at the supposedly dramatic moments. But, the imagery was stunning (including generous views of Tom Cruise's legs in his little man version of a mini-skirt) and it had some of the best lines I've heard in a long time. Case in point would be pretty much all the goblin Blix's lines. I mean, the guy rhymes almost everything he says. A creepy, rhyming goblin is just freaking awesome! "May be innocent, may be sweet...ain't half as nice as rotting meet." I love movies with quotes that you can whip at when with fellow nerds, or at a writers conference. Now, I will be well armed for my next encounter with those who have seen this movie. Embrace your own wackiness and enjoy being you!